B.Sc. in Renal Dialysis Technology is a 3- year undergraduate degree in engineering. Aspiring candidates with a +2 (Medical) or equivalent qualification are eligible to apply for the course. The course is designed to prepare students to administer haemodialysis treatments for patients with renal failure, under the supervision of a nurse or physician. The course imparts essential instruction to enrolled students in basic anatomy and physiology, dialysis preparation, dialysis prescription interpretation, extracorporeal circuit, dialyzer setup and maintenance, patient preparation, equipment monitoring, venepuncture and local anaesthesia administration, taking vital signs, documentation and communication, safety and sanitation, emergency interventions, and professional standards and ethics. B. Sc. in Renal Dialysis Technology covers specialties like cardiac care technology, respiratory care technology, dialysis technology, imaging sciences technology, clinical medical lab, among others. The basic course highlights for B.Sc. in Renal Dialysis Technology are tabulated below. Listed in the table below are some of the institutes in the country offering B.SC. 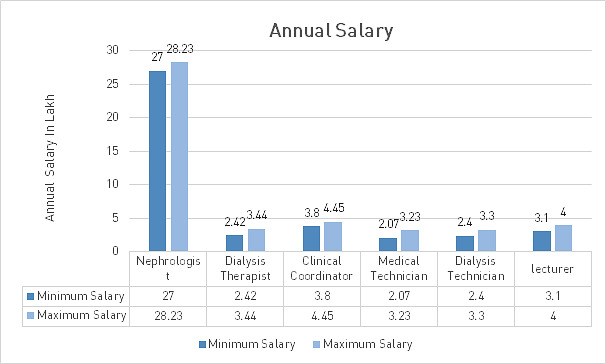 in Renal Dialysis Technology, along with their respective locations and the fee charged by each. Candidates having qualified 10+2 with Physics, Chemistry & either of Biology and Biology/ Maths as main subjects with a minimum aggregate score of 60% in classes X and XII are eligible to apply for the course. This percentage criterion, however, may vary across institutes. 1. Examination Pathway: Admissions through UPESEAT for up to 80% of the seats. This mode of admission requires a JEE Mains qualification besides a minimum aggregate score of 60% in at the Higher & Senior Secondary levels (classes X and XII) with Physics, Chemistry & Mathematics as the main subjects at the Senior Secondary level. JEE Mains cutoff is announced after the declaration of the JEE Mains results. 2. Non- Examination Pathway: Admissions through Board Merit / JEE Mains Score for up to 20% of the sea. This mode of admission requires a minimum aggregate score of 80% at the Higher & Senior Secondary levels (classes X and XII) with Physics, Chemistry & Mathematics as the main subjects. Admission is based on the round of university- level counselling which is based on the score obtained by the candidate in the UPES Engineering Aptitude Test (UPESEAT). Renal failure, or kidney diseases, results in the accumulation of excess of wastes and fluids in the blood that Dialysis Technicians help remove through the operation of a dialysis machine. Dialysis Technicians must have a thorough knowledge of how the dialysis machine functions and interacts with the human body. They are also responsible for cleaning and sterilizing the dialysis machine. Dialysis Technicians perform several other duties under the supervision of nurses and doctors, including recording patient information and measuring a patient's vital signs before, during, and after dialysis. Because these technicians come into contact with blood, they must understand and practise all safety precautions and have a thorough awareness of HIV and hepatitis prevention. Dialysis is an artificial process of assisting the excretion of waste and unwanted water from the blood. Our kidneys do this naturally. Some people, however, may have failed or damaged kidneys which cannot carry out the function properly, hence needing dialysis. Dialysis may be used for patients who have become ill and have acute kidney failure, or for fairly stable patients who have permanently lost kidney function. In recent years, the technology and techniques involved in the process of dialysis have evolved, opening a range of new options for those who require frequent dialysis procedures. This is particularly beneficial today when the number of patients with chronic kidney diseases is also increasing fast. A 3- year graduate program with 1 year of internship in Renal Dialysis provides students with the opportunity to study on an advanced level the principles of dialysis, basic medical science of the kidney, fluid and electrolyte balance, hematologic aspects, infectious diseases, dialysis systems and equipment, vascular access to circulation, blood chemistries, complications of renal failure, psychosocial aspects and an overview of peritoneal dialysis and renal transplantation. The program prepares under an adequate supervision of highly skilled medical professionals. A Renal Dialysis Technician sets up, evaluates, operates, and troubleshoots dialysis machines, and this knowledge is best employed to find work in quality control or other areas in dialysis machine manufacturing. The technician is also trained to monitor the condition of the patient, including taking vital signs and other medical evaluation criteria. Dialysis technicians can advance in their field through continuing education and learning a specialty. Some specialties include renal, acute dialysis and haemodialysis. You can become a dialysis technician with a high school diploma or GED and the completion of a training program, commonly available at community colleges and vocational schools. In order to practice, you must be certified or licensed through one of three accepted professional organizations and complete your individual state's requirements.